Time to stock up on earrings for my upcoming shows. Here are a few new earrings in a myriad of colors and styles. With the warm forecast I was inspired to work with turquoise today. Nothing says summer to me like turquoise! Some quick pictures of what I created. These are a mix of matte outback wood jasper, turquoise, copper and glass. Dragons Blood Jasper. I just love saying that name! The red in this stone is said to represent the blood of the dragon, and the green its skin. It is said to make one strong enough to fight and slay the mythical dragon. A mix of Dragons Blood Jasper, red glass rounds and glass seed beads with copper and pewter accents. Both necklaces have been SOLD. Each 30mm square stone pendant hangs from a double strand of glass seed beads and is accented with copper or pewter. They each remind me of a mini-landscape. This one has a red creek jasper dangle. The pendant reminds me of a landscape in Wyoming. In this one I see cliffs on each side with a frothy bay in between. This one looks like a winter landscape. If you have attended my studio sales before then you have seen Linda's beautiful pottery. She descibes her work as whimsical, hand built, painted porcelain that is functional and sculptural. I can attest to all that and more! Here are a few pictures of her work this spring. Pitcher set with chocolate sandy glaze. Bowl, plate and saucer with emerald night glaze. Visitors to this weekend's sale at my studio will find these new designs using Flower Jade. Flower Jade is a type of Jadeite. The variety of Jade known as Jadeite comes in a variety of colors including red, orange, yellow, green, blue, lilac, pink, black, white, and brown. Historically, Jadeite has been treasured in China as the royal gemstone, Yu, for 5,000 years. Mined in Japan, Myanmar, Guatemala and USA. All of the pendants below are 25 x 30mm faceted hexagons. Additional stones are 6mm and 4mm round stones or small cubes. Accents are glass seed beads, copper or pewter. The one above is choker length. Bracelet and earrings have been SOLD. Bracelets and earrings on the left have been SOLD. The necklace on the left has sold. Click on this one to enlarge it. The stone is beautiful! It reminds me of a beach scene. The next artist that will be at my studio sale April 11 and 12 is Meredith Arseneau with Picket Fence Designs. 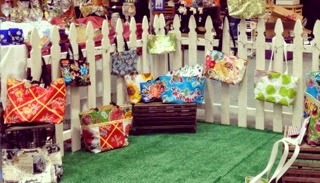 She handcrafts a variety of bags and totes from oil cloth and laminated cotton . Even the insides are fun and functional! She carries many different sizes and is happy to make custom bags. 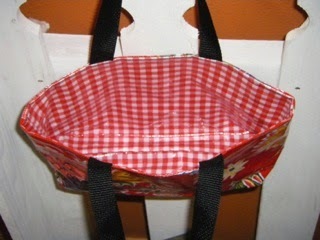 The dog treat bags pictured below were specially designed for a dog trainer. Bright and cheery sunflower large tote. Only a week left until my spring studio show. April 11 and 12 in Southworth. Contact me for your personal invitation. It is time to meet the artists that will be there. First up is It's A Perfect Day casual clothing company. Every day is perfect for something. It's a perfect day to laugh, to dance, to play, to love! What's your perfect day? The inspiration for Satya and Aimee Kommini's business came from a deep loss. They asked themselves how can we be happy despite the every day and unexpected circumstances that life brings? The answer was to do something they loved to do and to share that with others. Designing artwork for t-shirts was a natural fit. It was the way for them to express their creativity and share it with the rest of the world. Their brand name fulfills the promise of finding happiness in every single day of life. Free Spirit design - Free like a bird, free like a butterfly, free like the gentle breeze that blows and makes the trees dance. Free spirited you are like the way nature intended you to be. Express that inner free spirit with this beautiful shirt that is an embodiment of you. Yin-Yang design - Yin-Yang, a philosophical concept of balance. A pair of opposites that complement each other and are in harmony. This beautiful tee has the words - peace, love, harmony, forgiveness and compassion emblazoned over a hand drawn Yin-Yang symbol. Remember, every day has something perfect to offer. It is up to us to find that and be grateful for whatever power that allows us to experience this wonderful world.